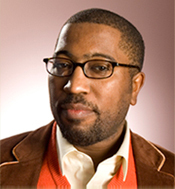 Major Jackson is an American poet, professor and the author of three collections of poetry: HOLDING COMPANY (W.W. Norton, 2010) and HOOPS (W.W. Norton, 2006), both finalists for an NAACP Image Award for Outstanding Literature-Poetry and LEAVING SATURN (University of Georgia, 2002), winner of the 2001 Cave Canem Poetry Prize and finalist for a National Book Critics Award Circle. He is also a recipient of a Whiting Writers' Award and has been honored by the Pew Fellowship in the Arts and the Witter Bynner Foundation in conjunction with the Library of Congress. Jackson is the Richard Dennis Green and Gold Professor at University of Vermont and a core faculty member of the Bennington Writing Seminars. He served as a creative arts fellow at the Radcliffe Institute for Advanced Study at Harvard University, as the Jack Kerouac Writer-in-Residence at University of Massachusetts-Lowell and currently serves as the Poetry Editor of the Harvard Review. This pocket-sized paperback is one of the twenty-four titles published for 2017 Hong Kong International Poetry Nights. The theme of IPHHK2017 is "Ancient Enmity". IPNHK is one of the most influential international poetry events in Asia. Leaving Saturn, chosen by Al Young as the winner of the Cave Canem Poetry Prize, is an ambitious and honest collection. Major Jackson, through both formal and free verse poems, renders visible the spirit of resilience, courage, and creativity he witnessed among his family, neighbors, and friends while growing up in Philadelphia. In these poems of broken unions and acute longing, Major Jackson explores art, literature, and music as seductive forces in our lives.